No Credit Check Payday Loans - What Are Your Options? What is a no credit check payday loan? 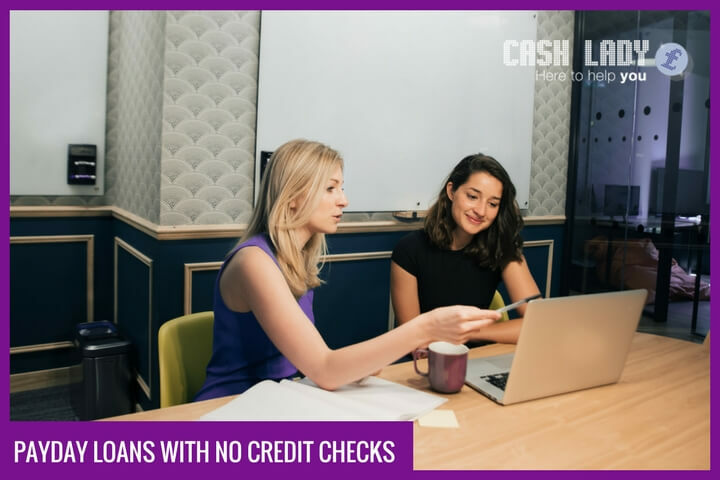 A no credit check payday loan is a short-term loan which is granted without the lender first carrying out a comprehensive review of your credit history. In truth, a no credit check loan will still utilise some form of soft credit search if the lender in question is regulated. Lenders can use this process to reach a loan decision based on the information they have. This means that your credit score is protected from the detrimental impact of a hard credit search and other credit providers companies cannot see these historical soft searches. If you want to accept the loan offer and complete your credit agreement, you will most likely have to undergo a formal credit check. A credit check is a review of information that is held centrally about your financial situation. It is used by lenders to assess how risky it would be to lend money to you. It is therefore used to assess whether they should lend to you at all, and if so what interest rate you should pay. A soft credit check is an enquiry into your credit file to look at certain information on your credit report. Companies perform soft searches to determine how successful your loan application would be without conducting a thorough examination of your credit history. It is like a background check to get a quick indication. Soft searches are not visible to other companies which means they have no impact on your credit score. What are hard credit checks? A hard credit check is when a lender reviews everything on your credit file. That is the type of check a bank or building society will use if you are applying for credit. They look at nearly every type of account that you have where you make regular payments. They check your credit file to see if you have missed any payments. They can also normally find out what your overall level of debt is (that is both your unsecured debt and secured debt like mortgages). Hard credit checks stay on your file for 12 months and every company who looks at your file can see who performed those checks and why. What does a lender look for? Together, this information makes up your ‘credit history’. Can I get a loan without a formal credit check in the UK? Companies that fail to comply with the rules can be fined, or ordered to compensate customers that they may have treated unfairly. In serious cases, the regulator can withdraw a firm’s permission to act as a lender. If you have a complaint regarding your lender, you can refer the matter to an independent adjudicator at the Financial Ombudsman Service. The Ombudsman has the power to force financial companies to pay compensation to any customers it may have disadvantaged. This strict regulatory environment should provide you with re-assurance. If you do business with an authorised payday lender or authorised credit broker, then you are dealing with a company that is subject to a wide-ranging series of rules, and which has a legal obligation to treat you fairly at all times. One of the regulator’s operational objectives, laid down by law, is to ‘secure an appropriate degree of protection for consumers’. Still, this does not mean you cannot get a loan quickly. Technology and data analytics help lenders reach a quick decision regarding affordability and risk when underwriting a loan. 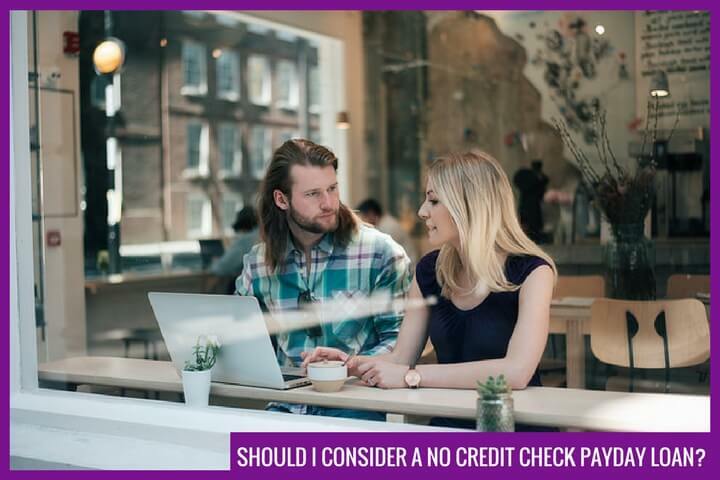 Should I consider a no credit check loan? If you are dealing with a new lender CashLady does not recommend this. Any company that suggests it can provide a payday loan without a credit check will be breaking the rules and likely offering money illegally. If you have an existing credit agreement with a lender with whom you have a good borrowing history, they may be able to offer you another loan or increase your credit limit without a hard check. Are no credit check payday loans legal? Lenders must carry out some form of credit check before reaching a decision on an application for credit. Payday loans are regulated by the Financial Conduct Authority (FCA), whose rules state that appropriate credit checks must be carried out on all applicants. If you are dealing with any person or company not regulated and authorised by the FCA you should not enter into any form of credit agreement for your own safety. Are no credit check payday loans safe? As a rule of thumb, a loan is only ‘safe’ if you can comfortably make the required repayments and the credit provider is authorised by the Financial Conduct Authority. 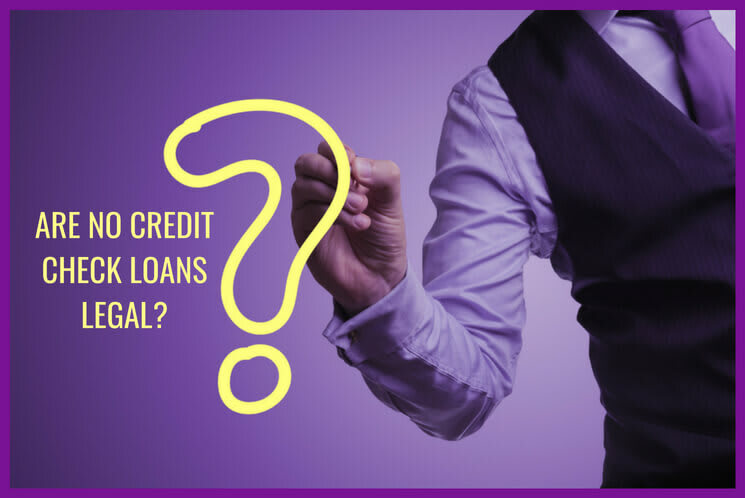 If you accept a loan without a credit check then it means that no-one has conducted an rigorous assessment of whether it is likely you will be able to repay it. No lender should offer you a payday loan if they have not first carried out a credit check, as to do so would involve breaching the FCA’s rules. If a company indicates that it is prepared to grant you a loan with no credit check, then it may indicate that the company is not actually authorised by the FCA, and is therefore operating illegally. It is certainly not ‘safe’ to do business with an unauthorised company. Before you deal with any financial services company, you can check if they are authorised on the Financial Services Register. If you choose to do business with an unauthorised company, then you would have no legal protection were things to go wrong. You would also be unable to refer any complaint about that company to the Financial Ombudsman Service. 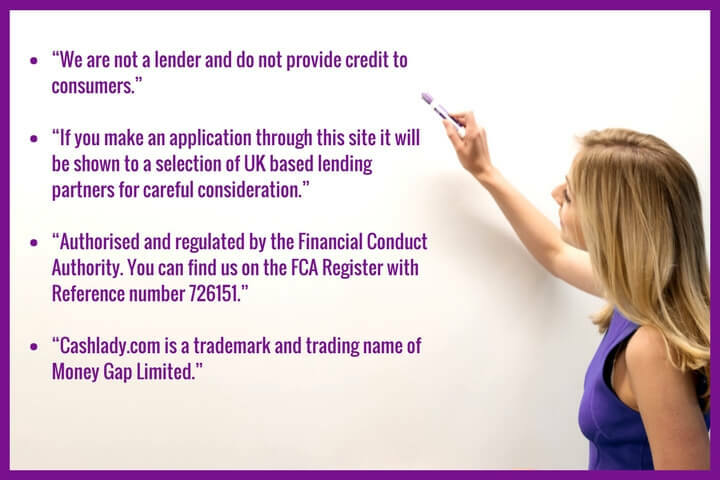 CashLady is authorised and regulated by the FCA to act as a credit broker. Why is a credit check important? Credit checks are important because they safeguard customers from poor credit decisions and avoid any unaffordable credit obligations. Credit checks are important for lenders so they can minimise any risk of bad debts. The credit checking process is used by lenders to determine the level of risk involved with lending money to you, and whether you are likely to be able to make the required repayments, and repay on time. When you apply for a loan, the lender will pay a fee to access your credit record. Records of your personal credit history may be held by any of the three main credit reference agencies in the UK: Experian, Equifax and Call Credit. There are usually two steps involved in checking your credit file. The first one is usually a soft online check to identify you, prevent fraud and check the level of risk and affordability of the loan. After initial approval there is usually a second step, before the actual lending that involves a more in-depth check were the lender must absolutely make sure you can afford your loan. They also want to make sure they can contact you in case of issues. Credit checks also consider the record of anyone with whom you have a financial link. If you for example have a joint account with your partner or anyone else, and that other person has a poor credit history, then this could adversely affect your own chances of being accepted for a loan. This is because the lender may assume that you pay the other person’s bills, and that this could place additional strain on your own financial affairs. All of this information is used to determine your ‘credit score’. This can be anything between 0 (very poor) and 999 (very good), according to Experian. Some lenders may automatically reject any applicant whose score is below a certain level. Any credit check that is carried out on you will leave a ‘footprint’, i.e. there will be a mark on your credit file showing that a check has been carried out. If a lot of checks are carried out on your file within a short space of time, this could harm your chances of being accepted. Can I perform a credit check myself before applying? You can always contact any of the credit reference agencies to check your credit score. You will be able to do this without adversely affecting your score. If you want to improve your financial situation, please visit our guide series for ideas on how to improve and rebuild your credit score. Do no credit check payday loans exist? I wish to opt in to SMS, telephone and email marketing.